Ever since my oldest was born I wanted a unique way to record her growth rate. 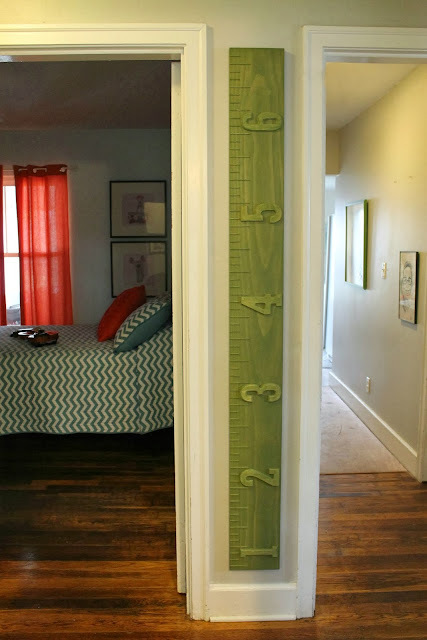 I loved the idea of marking her height on the door jam and wanted to create something that would allow me to do just that but be able to move it from place to place. We really didn't want to rip out the door jam every time we moved. My idea faded as time passed and was forgotten until I saw this rendition of a growth chart sold by Dear Lillie a year ago. 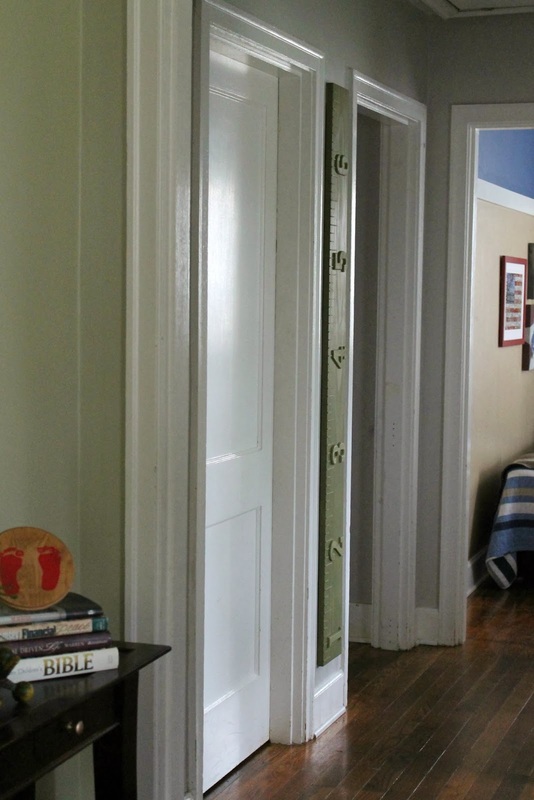 I wanted to recreate it for my home and scoured the web for inspiration. A mire 13 years later here we go! I wanted to do something slightly different than other DIYers. 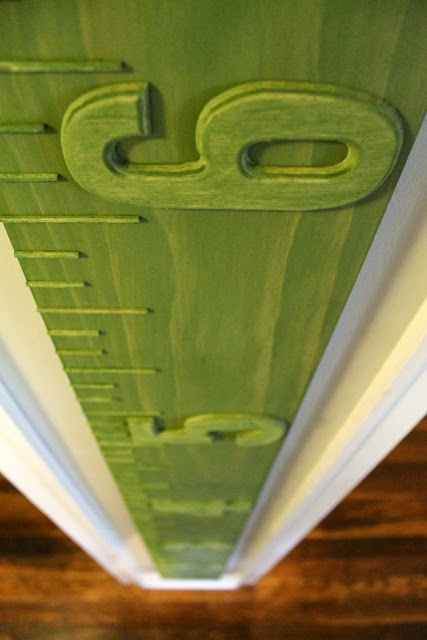 After buying a board and staining it green, I hung it on the wall and It hung there for almost a year before I settled on how I wanted to make the ruler. Did I want to draw the lines and numbers or did I want to buy a vinyl transfer? Decisions, Decisions! Since it set there for so long I'd started to like how the broad looked. It was like art...then it came to me, why not 3D?! I love how it turned out! It is completely different than anything I have seen on the web. Every element is 3 dimensional, from the lines to the numbers. Its just the look I was going for. My model didn't want to cooperate for longer than a second so mommy could get the perfect shot! What do you think of my 3 dimensional oversized ruler growth chart? 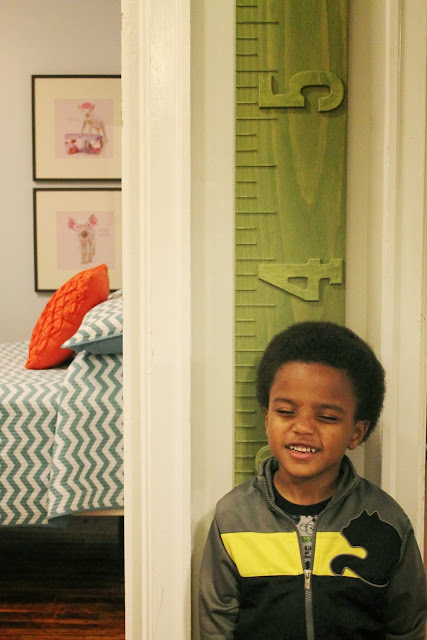 How do you record your children's height? Now all I need to do is start recording their heights, if I can bring myself to write on it. Problems I tell ya! :) See ya soon! 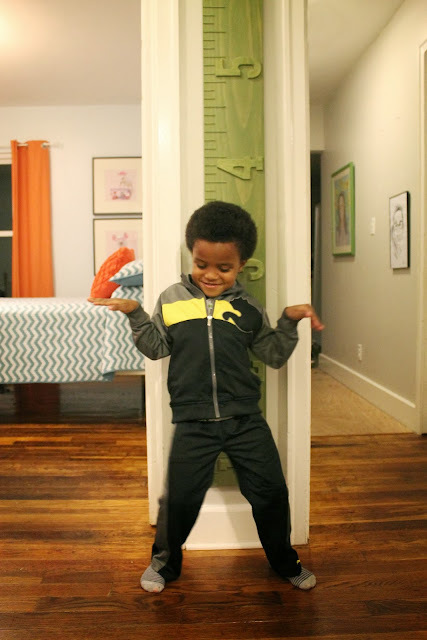 Linking up with Shabby Nest and Remodelaholic! It looks wonderful Darnetha!!!! Great job!!! I have one too in my little one's room but I bought mine from ETSY!!!! yours look way better, and the little man is surely very pleased! It's super cute, so cool that everything is three dimensional, so cute seeing your son loving the ruler too!! I totally think it rules ;) LOL. I know I'm a dork! Love it and I love his dance moves or isn't that what your cutie pie is doing? Love the color! What a great twist on all the growth rulers I've seen. And your son is adorable! This is awesome! Exactly what I was looking for....thank you for posting! I am so glad you like it, thanks for stopping by Jennifer! I love it! I can't find anything I like on Etsy or Pinterest. And I'm totally not handy. :( Would you mind sharing how you made this? I may have to convince my husband to help me with this project. Haha. Did you use a wood glue or something for the numbers and the ruler lines? What kind of stain/paint did you use? What kind of sticks did you use for the lines? Any help would be awesome! Thanks!